Every year, American Medical Response holds a nationwide skills competition amongst their divisions. Tryouts are held regionally and eventually the top six divisions in the country who scored the highest in the preliminary competition are sent to Colorado to compete for the right to brag that they are the best in the country. For the second year in a row, the Springfield, Massachusetts division is represented in the finals. Last year, it was a pair of paramedics Erin Markt and Kim Arnone who represented my old stomping grounds. 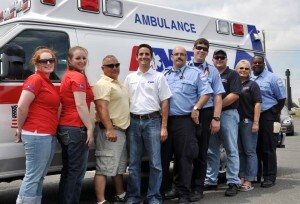 This year it is a pair of paramedics Nick Chirekos an Roy Rudolph who will be representing Western Massachusetts. The event is held in a large “simulated” city where a crew is given a fully stocked ambulance and asked to respond to calls in this mock setting where they are heavily monitored and thrown curve balls around every corner. The stories that Kim and Erin told me last year were great. It sounds like such a fun experience, and each of them took something from the competition. Left to right: Erin Markt, Kim Arnone, Jim Welcome, Patrick Leonardo, Roy Rudolph, Nick Chirekos, David Pelletier, Terri Leutsch, and David Mckenzie. First of all, I want to to say how great it is to see AMR holding an event like this. As the largest ambulance company in the United States, it rests on their shoulders to also strive for clinical excellence. Putting their divisions in the spotlight like this is a great way to showcase just how good the company has become clinically. While I am not surprised to see Springfield heading to the finals yet again, I feel like it is something that deserves quite a lot of attention. With the brewing turf war in Holyoke, Massachusetts with their fire department, and past investigative “reporting” on the division’s performance in Springfield that revolved around response times this is yet another example of how great the clinical care being provided in the greater Springfield area really is. While some will complain about AMR as a corporation and their motives in the medical field which are occasionally driven by their need to be a profitable company for the stakeholder’s sake, the motive for the street personnel has and always will be to deliver the best patient care that they are capable of. The stories that I still hear from people in Springfield bring a smile to my face. Cardiac arrest survivors walking into the lobby with a desire to meet the people who saved them. A ROSC rate which has skyrocketed. The continuation of a successful STEMI program. While much of this is due to management giving these projects the eventual nod that they needed to move forward, they are driven by the hard work of the field employees, research done by those splitting time between offices and the field, and a general willingness to trust evidence and embrace change. That is what is the true sign of a successful EMS system. Its providers have to be willing to evolve, even if their willingness to move forward surpasses the system’s willingness to allow them to move forward, much like it has in Springfield on a few different issues. When a paramedic exists in his or her little safe “bubble” in the back of an ambulance, allowing that change to happen and dealing with the growing pains that sometimes come along with it is not an easy thing to do. I am sure that there were some people up there who were ready to rush the patient out the door on that first cardiac arrest they encountered after the push to work codes longer on scene came down the pipe. I am sure there were some who said “this is not how I’ve always done it” and got uncomfortable because the change was, in fact, uncomfortable for them, but they believed, they were spurred along by those around them supporting them, and I can almost guarantee that the first time they saw sustained ROSC because of their efforts, they realized that they were in fact doing the right thing even if it did not feel natural to them at the time. When an EMS system grows together, these are the sort of results that they see and that is what is most important for every single person who calls 911. They need the most skilled provider standing in front of them when its their time to need help. And in an overwhelming majority of those instances, that ability far outweighs how fast that truck with the lights and sirens pulled up in front of their house. AMR Springfield continues to show that they provide that high level of service to those that they serve, and I am so proud of them for it, even a year and a half out from the system. I feel like a broken record with a topic like this but the fact is people still don’t seem to get it. They don’t have their priorities straight and that needs to change. But I am just one blogger, and one voice, and it is going to take a heck of a lot more than me and these 900 words to spur that along. None the less, I want to wish Nick and Roy the best of luck! As I post this rare Sunday post on the day of the competition, they’re probably elbow deep in some tricky scenario doing everything that they can to make sure that Springfield brings home the gold this year. Good get ’em guys, we’re all proud of you!